I'm in New England, trying to stay warm despite unseasonably raw weather. The warmest refuge, of course, is in the kitchen of my childhood home, surrounded by family for an all-too-rare holiday together. We crowd into the kitchen and around the dining room table, squeezing in conversation as the young cousins run happily through the house. There's no shortage of food. This is a home with one full-size refrigerator, a smaller supplemental refrigerator, and a standalone freezer, all so full there's a few extra bottles of white wine out chilling on the porch. This is a home where pulling together dinner from leftovers yields five main dishes to choose from. This is a home with 469 cookbooks. Give or take a few. The collection, sprawling across seven shelves, reflects a lifetime taking care of others. There are hundreds of small magazines picked up at the grocery market checkout, stacks of large collections (The Best of Shaker Cooking, the Better Homes and Gardens New Cook Book from the 1960s), and a dizzying array of very specific titles (The Creative Art of Garnishing, the Five Seasons Cranberry Book). Some date back to my mother's time as a newlywed (So Quick With New Bisquick, c. 1967, offers 280 recipes "to aid and abet your ingenuity"). And then there are the titles that appeared after the child-raising days (50 Splenda Recipes, for one, and ... The Hooters Cookbook?!). 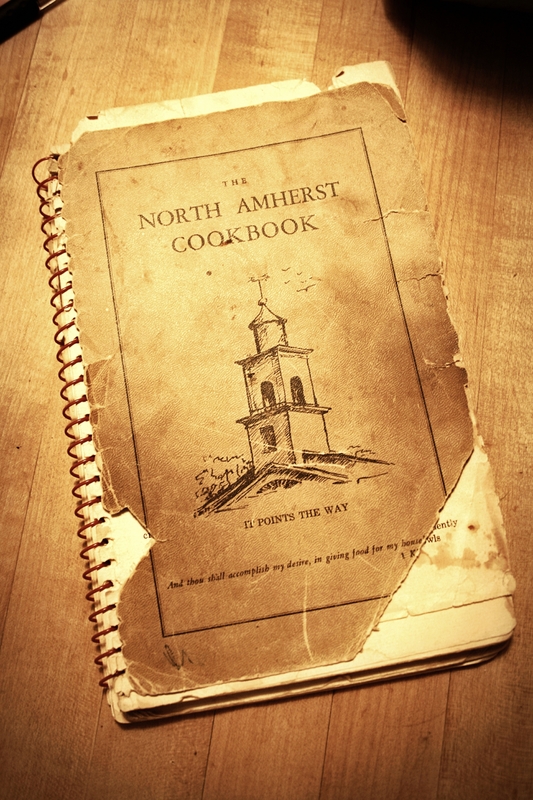 The most dog-eared cookbook is the 1945 North Amherst Cookbook, created by the Ladies Social Circle of the North Congregational Church of Amherst, Mass. My mother pulled it out this week to make what is simply titled "Apple Dessert." The women clearly wrote for a savvy audience: Many recipes don't bother with measurements, oven temperatures, or sometimes any baking directions at all. It's heavy on desserts, candies, and cookies, and salted pork. Apple Dessert, contributed by one Edith French, is similar to an apple cobbler but with "more of a cookie-like topping, instead of a cake-like topping," as my mother puts it. Her grandmother used to prepare it from this same cookbook, and my mother made it for her family when she was growing up and then for her own children. This week, she made it for a fifth generation. 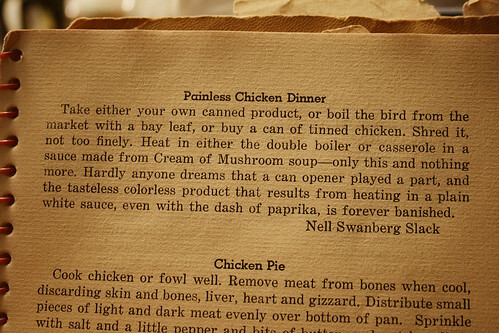 From The North Amherst Cookbook, published in 1945. Preheat oven to 375 degrees. Peel and slice apples. Fill pie plate or cast iron pan with sliced apples. Sprinkle with 1/2 cup sugar and cinnamon. Bake about 15 minutes. Remove pie plate or pan from oven and reduce oven temperature to 350 degrees. Mix remaining 1/2 cup sugar, egg, flour, baking powder, butter, and salt. Dot mixture over apples. Return to oven and bake for 35 minutes. I knew this would happen at some point of my cooking. But I was avoiding it. Here's the story: Once upon a time, a loooooong time ago I was tired of all the thought of being a meat eater without the guts to be an animal exterminator. Then I became vegetarian for a couple of years. I was a 18 years old University fresher, had nothing to lose and didn't have anybody to feed. But now, after years of being a happy meat eater, a researcher of the Culinary Arts, I found myself very concerned about the carnivorous dilemma. Just one e-mail and one website were enough to pull the trigger. And there I was on the top of my food inventions with a new challenge: Vegetarian Week, once a month, for all family. Why not? This is part of my new plan: Will offer everything to my kids, including the veggie option, so that if they decide to go without meat during their lives, they can also recognize-it as something comfortable, home-like. So, I surprised them with something my 4,5 years old defined as liquid pizza. My first option was to experiment with the content of an inviting picture on the cover of a Trader Joe's Meatless Italian Sausage package. In this recipe I used fresh pinto beans that I cooked on the night before with salt, oil, and bay leaves. You also can use canned organic beans, and frozen brown rice from Trader Joe's will give the same results. Over medium heat, heat beans, rice, water, garlic powder, and salt. When hot, process with an electric hand blender or regular blender. Grill slices of sausage in hot olive oil. For each serving, set sausage slices carefully on top of the soup, making a pizza-like design. Carefully top each slice of sausage with a cube of tomato, and add single drops of green Tabasco between each circle of sausage. A warm welcome to our new readers! We're so very happy to be able to share this with you, and both grateful and flattered to hear back from readers who are trying these recipes with your friends and families. We celebrated the launch of this blog with -- what else? -- a dinner party Saturday. Good food, good friends: a perfect pairing. We each prepared a few dishes, some in advance and some on the spot, that made feeding a crowd of nearly 50 a breeze. The menu featured a few tried-and-true favorites from our playdates: Anna dished up Turkey Chili with Mangoes, Yams with Za'atar, and Pink Pudding, and a friend contributed lemon zucchini bread (which disappeared fast! 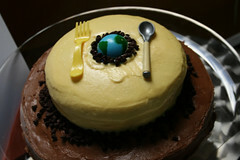 ), a cake sporting our new logo, dips, and the best deviled eggs I've ever had. I made Lemon Balm Pesto and a few loaves of bread, but decided to take a chance, a wild crazy chance, and make something up. The day of the party. My first attempt at apple and chicken meatballs last month yielded so-so results. I made one variation with soy sauce and cilantro, another with apple juice and sage, and a third with apple juice and thyme. It came out a little dry, a little too smooth in consistency, a little too boring. Kids were happy, adults saw potential. My testers offered some suggestions, I took notes, and began planning my second attempt. On Saturday, Anna stopped by with party supplies a few hours before guests were to arrive and found me wrist-deep in ground-up chicken and eyeing the first misshapen meatballs doubtfully. But once the first batch was done, I stopped fretting. More texture, more moisture, and a tiny tease of spice. The meatballs were satisfying solo, but even better with cranberry-apple chutney (from a jar, I freely admit). The meatball-making part can be a bit messy. Don't worry about forming perfectly shaped meatballs. Heat oil in sauté pan over medium heat. Add onion and garlic and saute a few minutes until softened and fragrant. Meanwhile, put bread chunks in a small bowl. Pour apple juice over bread chunks and let sit 10 to 15 minutes. Grate half of the apple; squeeze to remove some of the juice. Dice the other half of the apple. Put onion and garlic mixture in work bowl of food processor. Add chicken and process briefly until chicken is ground into small pieces. Don't overdo it! Put chicken, onion, and garlic mixture in a large bowl. Add the chopped sage, grated and diced apple, egg, curry, and salt and pepper. Squeeze juice from bread chunks and add bread to the bowl. Mix thoroughly. Form mixture into meatballs. Put flour in a shallow dish. Form mixture into meatballs, rolling each one in flour to coat. Pan-fry over medium heat, turning often to brown evenly, until thoroughly cooked.